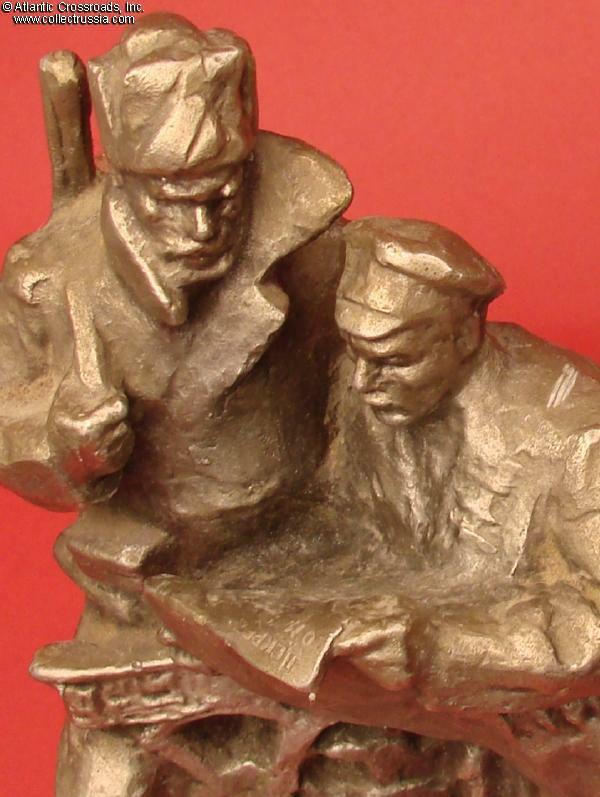 Soldier and Worker Reading the Decree of Peace, full figure statuette, circa late 1960s - early 70s. 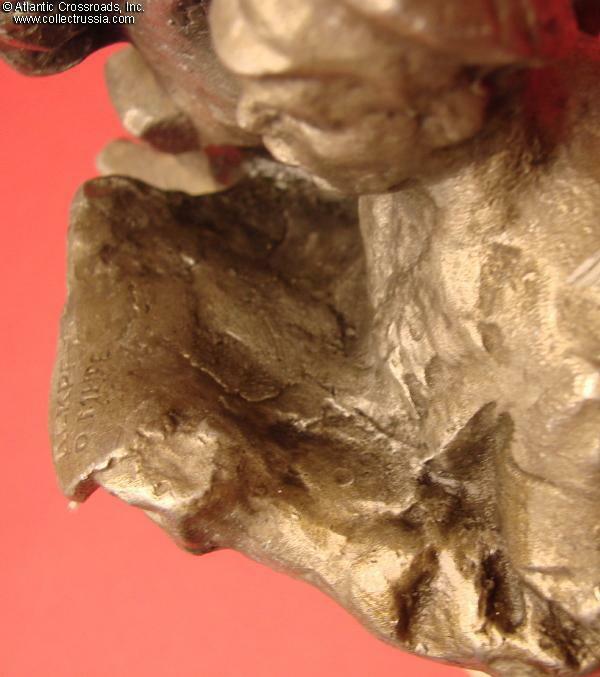 In Silumin alloy, measures nearly 10" in height; the base is 6" x 3 ¾ ". 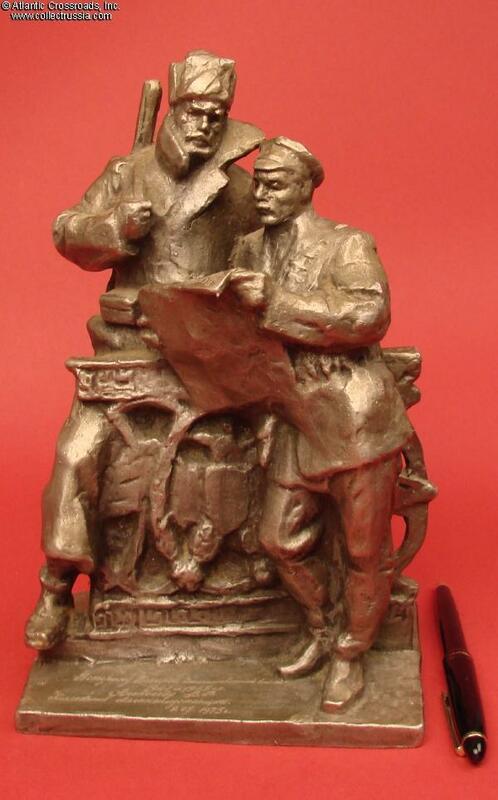 This massive and very complex statuette depicts two men reading a paper headlined "The Decree of Peace". One of them, a typical member of the workers Red Guard militia, has ammunition bandoliers and a holstered sidearm. Another, a bearded peasant soldier, is dressed in Imperial Army uniform including a greatcoat and tall fur hat, and has a rifle slung behind his back. Note that the broken balustrade of the balcony where they are standing has Imperial double-headed eagle - a clear reference to the fallen old regime. 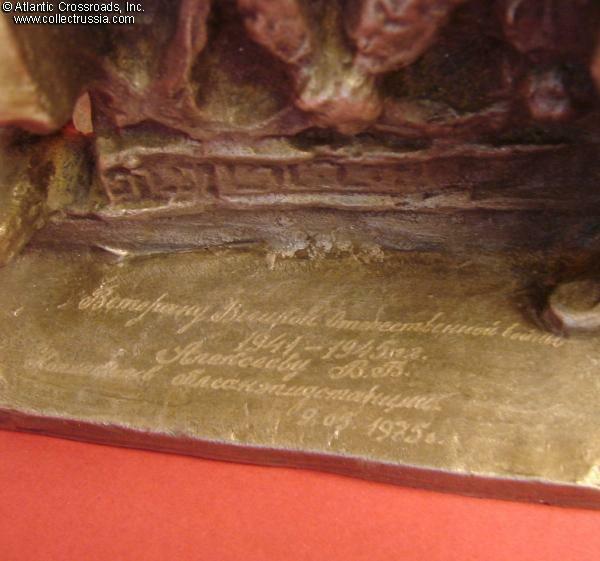 There is a presentation engraving on the plinth that reads "To a veteran of the Great Patriotic War of 1941-1945 V. B. Alekseev from the team of the regional Sanepidemstantsiya (hygiene and epidemiological control station)". 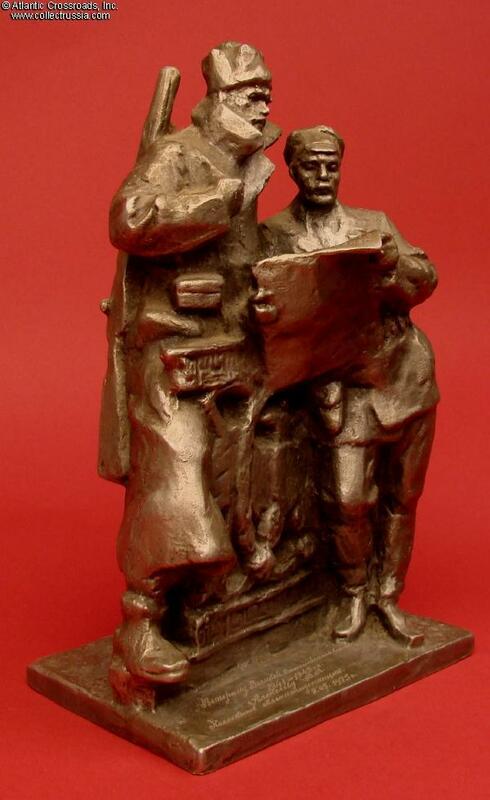 The original model for the statuette was created in 1968, obviously to coincide with the 50th anniversary of the October Revolution. 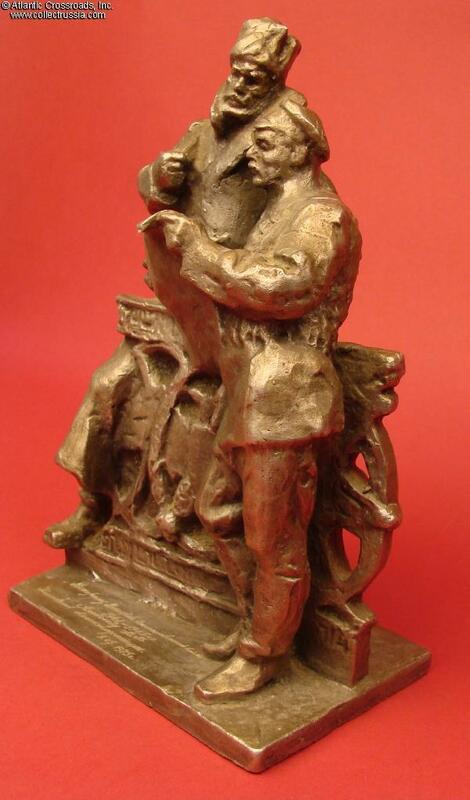 The statuette was manufactured by the Monumentalnaya Skulptura ("Monumental Sculpture") Factory in Leningrad during that year and possibly for a few years afterwards. 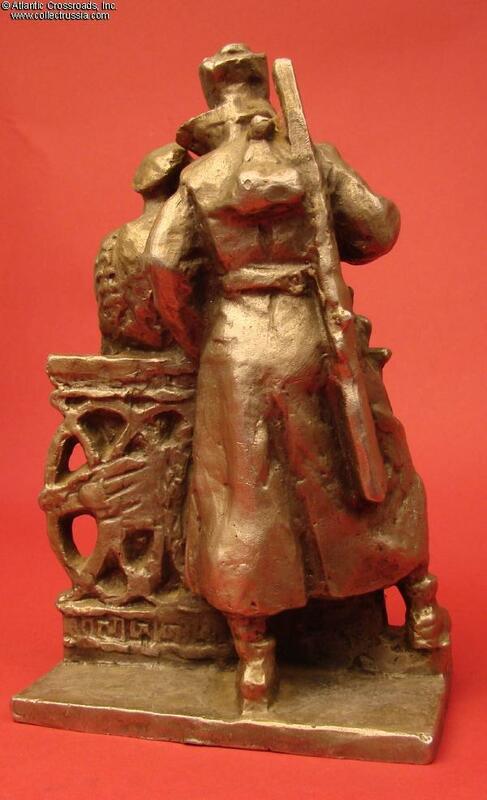 The statuette is in good overall condition. The tip of the soldier's rifle with bayonet has broken off, and its tip has been carefully filed to smoothen the rough edge. Beside a couple of minor scuffs on the edges, there are no other flaws. The statuette is free of visible dents or dings; its details and finish are nicely preserved. There is very attractive age patina throughout, no pitting or discoloration spots. The Decree of Peace was of course the very first of the two much publicized decrees of the new Soviet Bolshevik regime issued on the next day after the violent overthrow of the Provisional Government in Petrograd (the other one was The Decree of Land expropriating the large landowners, supposedly to benefit the peasants). The "peace" decree essentially abrogated Russia's responsibilities toward her WW1 Entente allies and dissolved the already crumbling armies at the German front. Eventually it led to the intervention by allied powers concerned that the massive military stores they had shipped to Russia might fall into the German hands.